Different spectral bands yield insight about our precious and continually changing earth. Scientists and GIS analysts use Landsat to keep an eye on places like the Cambridge Gulf in Australia (above), where mangroves are threatened by cyclones and industrialization. Farmers and analysts can measure how crops are developing in places like Bakersfield, California (above). Different crops appear in different colours at specific times in their growth cycle. Variations indicate stress due to lack of water or fertilizer. This analysis helps not only farmers, but also analysts who predict market prices based on supply. Landsat's work is epic in scale. In 43 years, it has amassed over a petabyte of data, with over 4 million scenes and counting. ArcGIS lets you use Landsat in your own apps, with new scenes added daily. Tip 1: Use the symbols to try different spectral views. Some are combinations of bands and others computed indices. Tip 2: Use the time slider to see how places change over time. Tip 3: For more details on any location, click identify, then click on the map. Tip 4: ArcGIS automatically enhances the image based on your current view, so try zooming and panning. This is all powered by ArcGIS running on the Amazon Web Services Cloud. 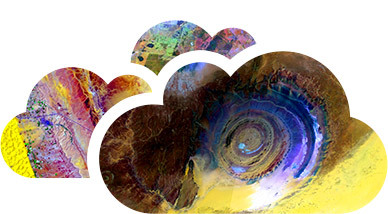 We bring Landsat to millions of users all over the world. Ready to explore or analyze? Log in to ArcGIS Online and start adding Landsat layers to your maps. Do you have large collections of imagery? ArcGIS can make them accessible, whether it's on-premises or in the Amazon cloud. The Landsat program has amassed information on the changing earth since 1972, producing significant benefits in areas such as climate studies, agriculture and environmental monitoring. In March 2015, efforts by public and private sectors have provided a new way to access this resource.